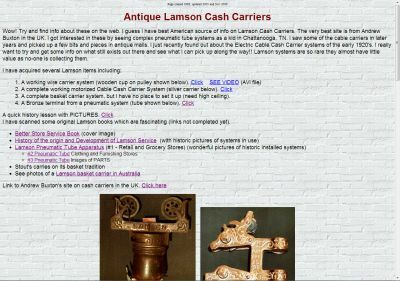 Fred Lupton of Dearborn MI, USA has a website covering cash registers and cash carriers with photographs of his cable carrier system, wire carriers and a pneumatic tube carrier. It also includes scans from some Lamson publications. 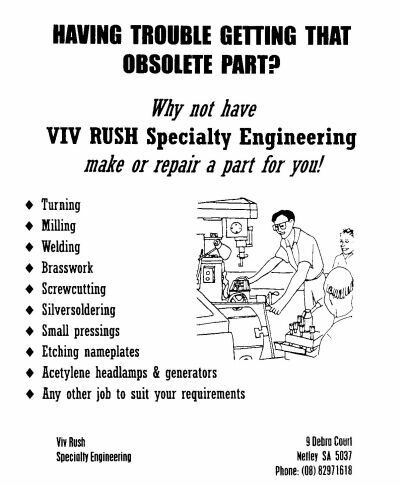 Vivian Rush Specialty Engineering, 9 Debra Court, Netley, SA 5037, Australia. A reproduction Rapid Wire system with two propulsions, one car, poles and wire is being offered for sale by its maker,Viv Rush. It was formerly on loan to a museum. Viv is based in South Australia but is willing to assist with installation of the system. The asking price is 6,600 Australian dollars. A complete car costs 390 AUD. New "rubbers" for the propulsion cost 12-15 AUD.